A tediously routine romantic comedy, Two Weeks Notice has two attractive stars struggling against a large dose of the mundane. In New York, Lucy Kelson (Sandra Bullock) is an idealistic lawyer, working for the poor and the disadvantaged and fighting for the conservation of heritage buildings. George Wade (Hugh Grant) is the laid back and philandering chief executive of the Wade Corporation, a large real estate development firm and often the target of Lucy's protests. When Lucy tries to appeal to George to save an old community centre building in her Coney Island neighbourhood, he ends up hiring her instead as his new Chief Counsel. Lucy's proficiency means that she starts to run every detail of George's life, and he grows totally dependent on her. Although they start to fall in love, Lucy cannot handle George's constant neediness and she submits her notice to resign. As Lucy tries to help hire a replacement, her fledgling relationship with George is further threatened when economic pressures mean that the community centre may fall victim to the wrecking ball after all. 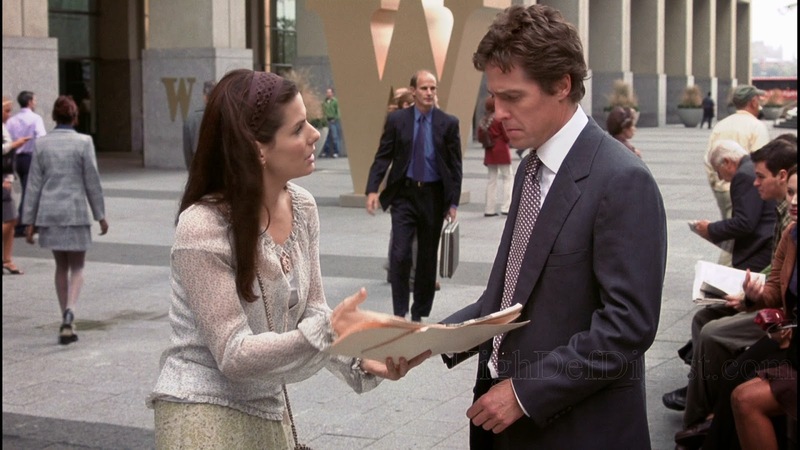 Two Weeks Notice rides a linear rail from start to finish, and rarely finds any memorable moments of distraction or innovation. The progression and outcome of the romance are oh-so-predictable even for the genre. While there are a few laughs to enjoy, mostly delivered by Grant's trademark drollness, the film mostly just counts down the time to its predetermined conclusion. Grant and Bullock (who also produced) do their best, and they develop a reasonably quirky chemistry. But at 42 and 38 respectively, they are both straining against the relative immaturity that the contrived opposites-attracts romance demands. The supporting cast is generally weak and contributes little to the film. Alicia Witt does add a bit of a spark when she makes a late appearance as a not-so-innocent applicant to replace Lucy. Otherwise, Dana Ivey and Robert Klein as Lucy's utopian parents and David Haig as George's hard-nosed brother are given precious little to do by director Marc Lawrence's script. Two Weeks Notice turns out to be too long to hang around. The film is totally forgotten in more like two minutes.